Being a mathematics wizard since young, Tan Yin Xiang, an A-Level’s student from INTI International College Penang (INTI), recently proved his mettle at the ICAS Maths Test, earning High Distinction and also being ranked among the top 1% of entrants in Malaysia for ICAS. Tan Yin Xiang (2nd from left), an A-Level student at INTI International College Penang, joyfully receiving his medal from Tan Sri Emeritus Professor Syed Jalaludin Syed Salim (2nd from right), the Advisor of Educational Assessment and Testing Services (EATS). Produced by Educational Assessment Australia (EAA), an education group of UNSW Global Pty Limited, a wholly owned enterprise of the University of New South Wales (UNSW), the ICAS test is a series of independent skills-based assessments with an element of competition, developed annually for students from primary to pre university levels. The test covers a number of subjects including Digital Technologies, English, Mathematics, Sciences and Writing. As a frequent participant in different mathematics competitions since he was in secondary school, Tan decided to take part in the ICAS Maths Test after his lecturer at INTI, Mr Mok Kam Fatt, announced the test in his class. “We usually have about 60 students from INTI who participate in the ICAS Maths Test yearly and achieve High Distinctions each year. This reflects the high knowledge of mathematics among INTI’s pre-university students, which extends beyond the level of higher studies and complements their competencies when moving into more demanding programmes and future careers,” said Mr Dinash Kandasamy, the Head of School of Pre University Studies. As achieving a High Distinction is rare, Tan attributed his success to Mr Mok Kam Fatt, who worked with him and other fellow students on past year questions before the test and who uploaded them using INTI’s online Learning Management System, Blackboard. “I was excited to receive such a high achievement. I believe in the phrase ‘practise makes perfect’, this has always been my winning strategy in everything I do. As I wish to become an actuary in the future, this achievement has enhanced my learning portfolio and given me an edge in applying to programmes for Actuarial Science. I am grateful to my lecturer and for the experiences I have gained at INTI, which have provided me a foundation for my tertiary education journey,” explained Tan. Beyond regular classroom learning, INTI encourages its students to participate in such opportunities, which enables them to build on their academic and professional skills. Through exposure in certifications, competitions and practical experiences, INTI students gain the competencies they need for the future workplace from as early as their foundation years in college. 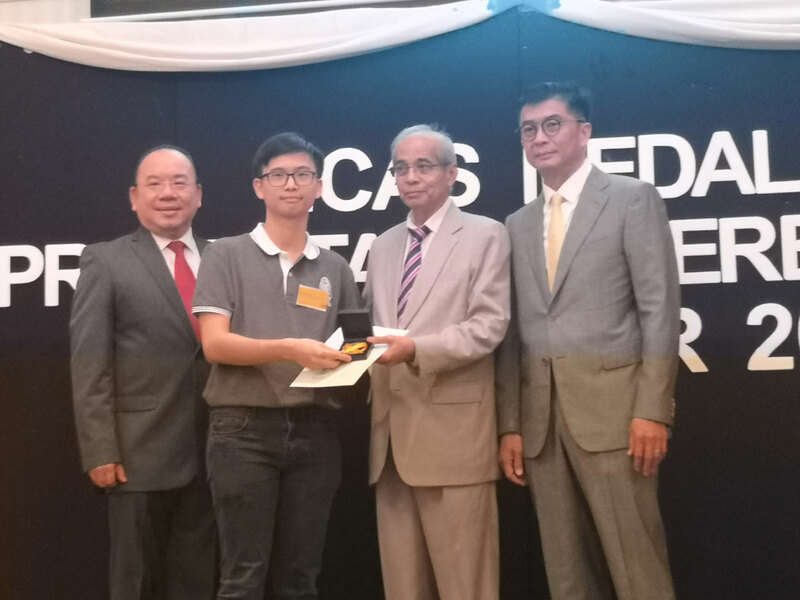 During the ICAS Medal Presentation Ceremony 2018 held in Petaling Jaya recently, Tan joyfully received his medal from Tan Sri Emeritus Professor Syed Jalaludin Syed Salim, the Advisor of the Educational Assessment and Testing Services (EATS). Tan’s achievement has truly made his parents, college mates and State proud.